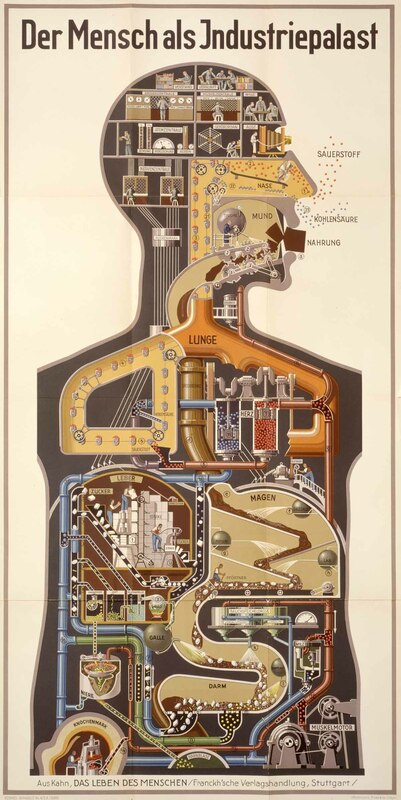 In 1926, Fritz Kahn, a German gynecologist and anatomy textbook author, produced a lithograph called Der Mensch als Industriepalast (Man as Industrial Palace) that depicted the human body as a factory, a chemical plant of sorts. Kahn's body came complete with mechanical lungs, a rock-sorting stomach, gears for a throat, and a switchboard for a brain, and it illustrated rather metaphorically the degree to which industrialization had taken over Western life, creating deep anxiety for some and curiosity for others. More than 80 years later, Henning Lederer, a German artist, has brought Kahn's mechanical body to life with some gifted animation. To learn more about Lederer's project, you will want to spend more time on IndustriePalast.com and particularly with this helpful PDF. Other animation by Lederer can be found on Vimeo. An earlier version of this post originally appeared on our site in 2011.